In this lesson, we will learn how to relate between multiplication and division processes and deduce that division is the inverse of multiplication. There are 44 children in a room. Each group of 4 children is sitting around a table. How many tables are there? If 4 × 7 = 2 8 , then 2 8 ÷ 4 = . 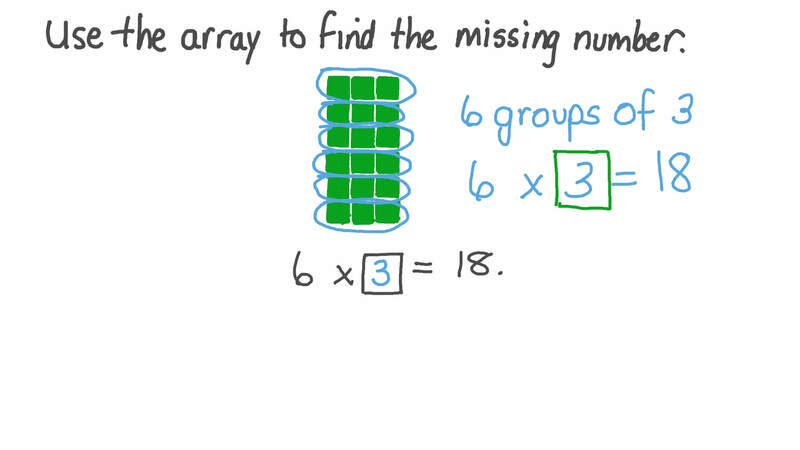 Use the array to find the missing number. A girl wants to share 45 oranges equally among 5 people. How many oranges will each person receive? When notebooks were distributed equally among students, each student received 3 notebooks. When sweets were distributed equally among children, each child received 7 sweets. Given 6 4 × 6 3 = 4 0 3 2 , is 4 0 3 2 ÷ 6 3 = 6 4 true or false? Division is the inverse of multiplication. Use Dina’s fact to solve Amir’s problem. Which multiplication equation can be represented by the model? Pick a division equation that the model can help you solve. A 4 8 ÷ 7 = ? B 5 6 ÷ 7 = ? C 6 4 ÷ 7 = ? 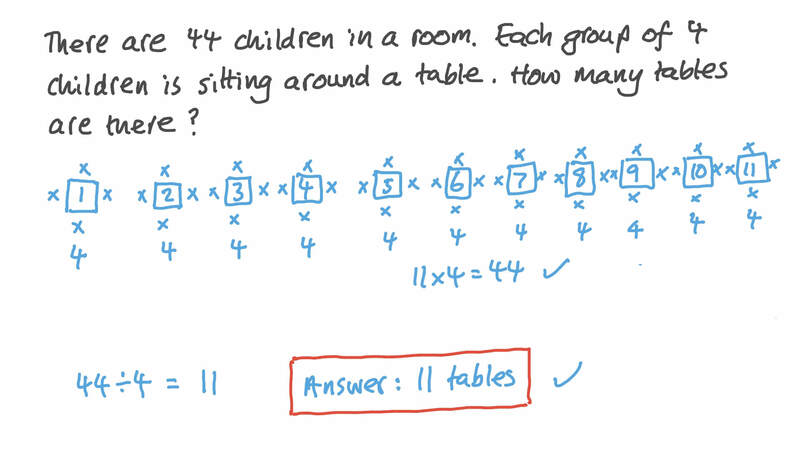 Let’s think about solving division problems. Pick an equation that can help you solve 4 2 ÷ 6 . What is 4 2 ÷ 6 ? 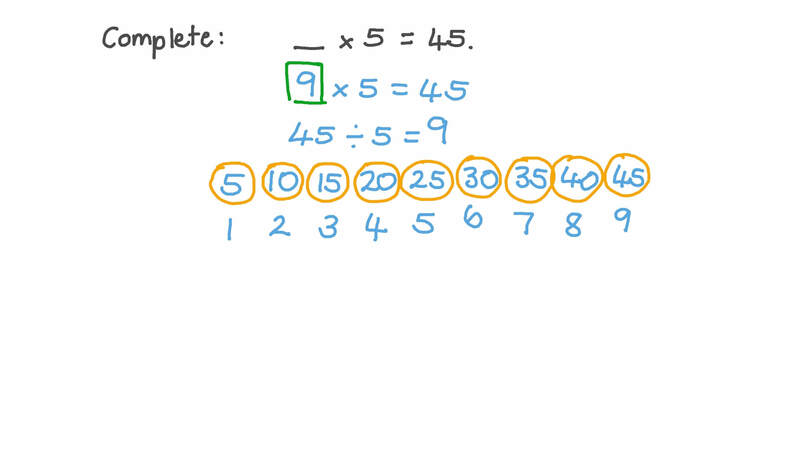 We can use multiplication to solve division problems. Pick a model that would help you solve 2 7 ÷ 3 . What is 2 7 ÷ 3 ? Which of these is an inverse equation of 6 × 4 = 2 4 ? An inverse equation of 2 × 4 = 8 is 8 ÷ 4 = 2 . Find an inverse equation of 6 × 3 = 1 8 . Which of these is an inverse equation of 5 4 ÷ 9 = 6 ? 3 rows of triangles = 21 triangles. The model shows that 3 × 6 = 1 8 . The model can also be used to show division equations. What number is missing from the equation 1 8 ÷ 3 = ? Find the missing numbers by making 6 equal groups from these 54 books.